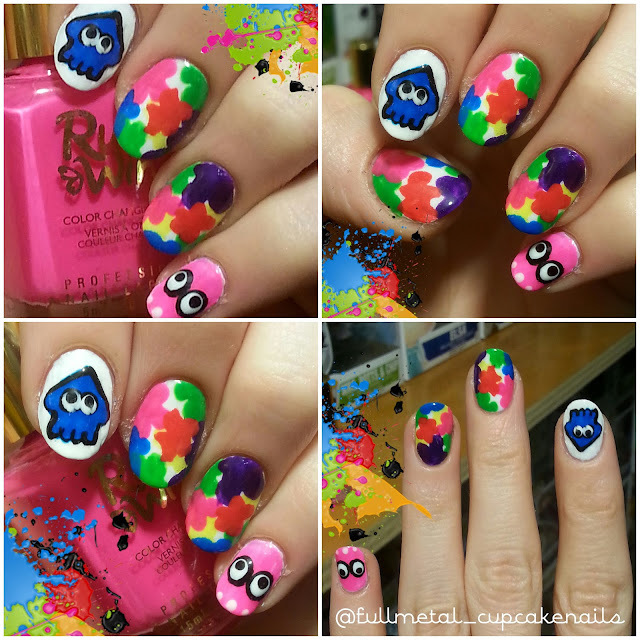 Fullmetal Cupcake: Splatoon nail art! So some of you may know that I'm an avid gamer. I even recently started a second blog The Nerdy Cupcake (http://the-nerdycupcake.blogspot.ca) where I discuss and review my interests outside of nail art. To celebrate this, and the new release game Splatoon I have done these killer Splatoon themed nails! This game is the best, I am totally enthralled in it at the moment. I hope you guys like the nail art! A list of colors used will be at the end of the post! Let me know what you think guys, are you gamers? Do you like Splatoon? Tell me below, and catch you next time! Feel free to check out nerd blog as well guys, now here are the colors!